Today will be a big day for the European Central Banks (ECB) as they are on opposite sides of the FED. FED Chair Dr. Yellen appeared before Congress today to make her case to increase short-term rate at the FED on December 16, 2015. “WASHINGTON – Federal Reserve Chair Janet Yellen tells Congress that economic conditions are falling into place for policymakers to raise interest rates when they meet in two weeks — as long as there are no major shocks that undermine her confidence. Yellen says that even after the first increase, rates will still be at very low levels, which should encourage more borrowing by consumers and businesses. In testimony before the Joint Economic Committee, Yellen says further delays in a Fed rate hike could force the central bank to tighten credit too quickly later. Such an abrupt move could push the economy into a recession. The SPX continues to find resistance at the 2100 resistance level. The market and its participants seem to lack any enthusiasm. It’s my belief that the markets are awaiting a big news release from the FED regarding a “potential” rate increase which the markets currently does not favor. Will there be a FED increase in the Fed Fund Rates or is this much to do about nothing AGAIN! Is the FED going to continue to kick the can down the road even further? That is the million dollar question. History shows us that the fed typically raises rates a little near just before a bear market starts in hopes they can continue to convince the masses (investors) that the economy is fine and dandy, nothing to worry about. And its that rate hike that tips the scale, triggers a bear market and clobbers the average investor holding stocks in their portfolio. I talked about this in a recent interview I did with Jim Goddard on HoweStreet.com. Inflation continues to decline at home and abroad. The FED’s measure of inflation, the core PCE deflator, is running at about a 1-percent annual rate which is half of the Fed’s stated target. On Tuesday, December 2, 2015, Oil broke its “psychological level” of $40/barrel to $39.84. The last time this occurred was back in 2008, when the price of oil crashed below $40/barrel just before the stock market collapsed. Now, it has happened again. The bond yields of the 10 year treasuries (TNX) have been declining over the past few days. The 20 year Treasury bond ETF (TLT) is rising and currently closed last night at 123.04. Apparently, they have serious doubts about any FED rate increase as well. 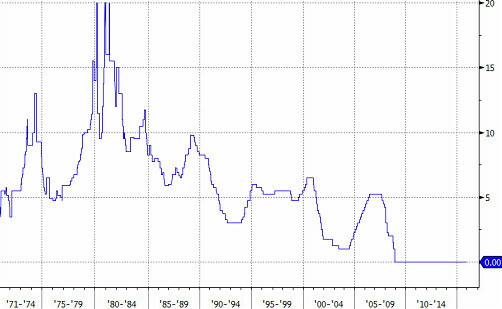 Any increase, in short term rates, by the FED would be a catastrophic mistake. It would have severe global consequences. An interest rate hike will just push the U.S. Dollar even higher. The rising U.S. Dollar is already crippling emerging markets all around the globe. This would turn out to be a tragic mistake by the FED? The post The Fed, Rate Hike & Outlook appeared first on Gold Forecast – Silver Forecast – ETF Trading Strategies – ETF Trading Newsletter.